A State Party to the present Protocol (“State Party”) recognizes the competence of the Committee on the Rights of Persons with Disabilities (“the Committee”) to receive and consider communications from or on behalf of individuals or groups of individuals subject to its jurisdiction who claim to be victims of a violation by that State Party of the provisions of the Convention. No communication shall be received by the Committee if it concerns a State Party to the Convention that is not a party to the present Protocol. The facts that are the subject of the communication occurred prior to the entry into force of the present Protocol for the State Party concerned unless those facts continued after that date. Subject to the provisions of article 2 of the present Protocol, the Committee shall bring any communications submitted to it confidentially to the attention of the State Party. Within six months, the receiving State shall submit to the Committee written explanations or statements clarifying the matter and the remedy, if any, that may have been taken by that State. At any time after the receipt of a communication and before a determination on the merits has been reached, the Committee may transmit to the State Party concerned for its urgent consideration a request that the State Party take such interim measures as may be necessary to avoid possible irreparable damage to the victim or victims of the alleged violation. Where the Committee exercises its discretion under paragraph 1 of this article, this does not imply a determination on admissibility or on the merits of the communication. The Committee shall hold closed meetings when examining communications under the present Protocol. After examining a communication, the Committee shall forward its suggestions and recommendations, if any, to the State Party concerned and to the petitioner. If the Committee receives reliable information indicating grave or systematic violations by a State Party of rights set forth in the Convention, the Committee shall invite that State Party to cooperate in the examination of the information and to this end submit observations with regard to the information concerned. Taking into account any observations that may have been submitted by the State Party concerned as well as any other reliable information available to it, the Committee may designate one or more of its members to conduct an inquiry and to report urgently to the Committee. Where warranted and with the consent of the State Party, the inquiry may include a visit to its territory. After examining the findings of such an inquiry, the Committee shall transmit these findings to the State Party concerned together with any comments and recommendations. The State Party concerned shall, within six months of receiving the findings, comments and recommendations transmitted by the Committee, submit its observations to the Committee. Such an inquiry shall be conducted confidentially and the cooperation of the State Party shall be sought at all stages of the proceedings. The Committee may invite the State Party concerned to include in its report under article 35 of the Convention details of any measures taken in response to an inquiry conducted under article 6 of the present Protocol. The Committee may, if necessary, after the end of the period of six months referred to in article 6, paragraph 4, invite the State Party concerned to inform it of the measures taken in response to such an inquiry. Each State Party may, at the time of signature or ratification of the present Protocol or accession thereto, declare that it does not recognize the competence of the Committee provided for in articles 6 and 7. The Secretary-General of the United Nations shall be the depositary of the present Protocol. 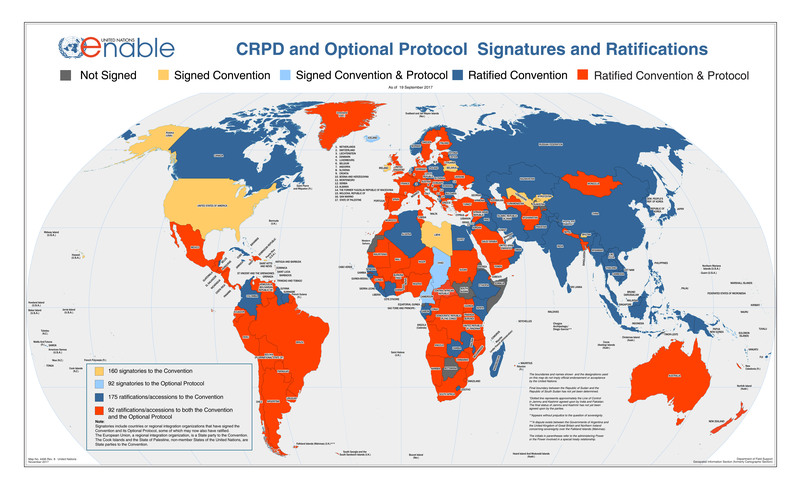 The present Protocol shall be open for signature by signatory States and regional integration organizations of the Convention at United Nations Headquarters in New York as of 30 March 2007. The present Protocol shall be subject to ratification by signatory States of the present Protocol which have ratified or acceded to the Convention. It shall be subject to formal confirmation by signatory regional integration organizations of the present Protocol which have formally confirmed or acceded to the Convention. It shall be open for accession by any State or regional integration organization which has ratified, formally confirmed or acceded to the Convention and which has not signed the Protocol. “Regional integration organization” shall mean an organization constituted by sovereign States of a given region, to which its member States have transferred competence in respect of matters governed by the Convention and the present Protocol. Such organizations shall declare, in their instruments of formal confirmation or accession, the extent of their competence with respect to matters governed by the Convention and the present Protocol. Subsequently, they shall inform the depositary of any substantial modification in the extent of their competence. References to “States Parties” in the present Protocol shall apply to such organizations within the limits of their competence. For the purposes of article 13, paragraph 1, and article 15, paragraph 2, of the present Protocol, any instrument deposited by a regional integration organization shall not be counted. Regional integration organizations, in matters within their competence, may exercise their right to vote in the meeting of States Parties, with a number of votes equal to the number of their member States that are Parties to the present Protocol. Such an organization shall not exercise its right to vote if any of its member States exercises its right, and vice versa. Subject to the entry into force of the Convention, the present Protocol shall enter into force on the thirtieth day after the deposit of the tenth instrument of ratification or accession. For each State or regional integration organization ratifying, formally confirming or acceding to the present Protocol after the deposit of the tenth such instrument, the Protocol shall enter into force on the thirtieth day after the deposit of its own such instrument. Reservations incompatible with the object and purpose of the present Protocol shall not be permitted. Reservations may be withdrawn at any time. Any State Party may propose an amendment to the present Protocol and submit it to the Secretary-General of the United Nations. The Secretary-General shall communicate any proposed amendments to States Parties, with a request to be notified whether they favour a meeting of States Parties for the purpose of considering and deciding upon the proposals. In the event that, within four months from the date of such communication, at least one third of the States Parties favour such a meeting, the Secretary-General shall convene the meeting under the auspices of the United Nations. Any amendment adopted by a majority of two thirds of the States Parties present and voting shall be submitted by the Secretary-General to the General Assembly of the United Nations for approval and thereafter to all States Parties for acceptance. An amendment adopted and approved in accordance with paragraph 1 of this article shall enter into force on the thirtieth day after the number of instruments of acceptance deposited reaches two thirds of the number of States Parties at the date of adoption of the amendment. Thereafter, the amendment shall enter into force for any State Party on the thirtieth day following the deposit of its own instrument of acceptance. An amendment shall be binding only on those States Parties which have accepted it. A State Party may denounce the present Protocol by written notification to the Secretary-General of the United Nations. The denunciation shall become effective one year after the date of receipt of the notification by the Secretary-General. The text of the present Protocol shall be made available in accessible formats. The Arabic, Chinese, English, French, Russian and Spanish texts of the present Protocol shall be equally authentic. IN WITNESS THEREOF the undersigned plenipotentiaries, being duly authorized thereto by their respective Governments, have signed the present Protocol.